This free-to-play game is set in a rectangular room and the objective is simple, you just have to jump from one piece of furniture to another without falling into burning hot lava. There is a bit of strategy involved which comes in the form of using the hearts you collect to your advantage to keep jumping as long as possible. The game was designed to be difficult so minimise distractions before you start playing and try not to get too stressed. 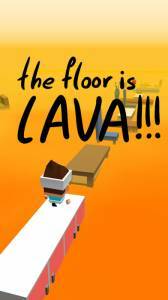 The Floor Is Lava is very creative with nice colourful 3D graphics. Your character is moved from one piece of furniture to another using a simple set of (One Touch) controls which have a decent level of functionality. The only real problems the game has though is that the camera angle can sometimes be confusing and leave you wondering when to jump next and there will be instances where jumps are longer than the space one jump covers and there is no option for a double jump. As the game now stands it could use an update or two to correct these problems otherwise it has the potential to be a very good game. This game is made by Ketchapp which means it is going to suffer from a lot of advertising which has the annoying habit of appearing in the middle of a complex situations and obscuring your view . There is however the option to pay real money to remove the adverts.